Published: May 12, 2016 at 06:02 p.m. Updated: May 13, 2016 at 04:10 p.m. 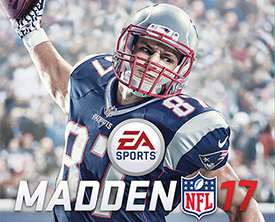 Rob Gronkowski was revealed as the cover athlete for Electronic Arts' Madden NFL 17 on Thursday. Gronk joined an impressive fraternity of cover athletes which includes such NFL luminaries Brett Favre, Mike Vick and Barry Sanders (anybody who has played Madden before knows Madden NFL 2004 Vick might be the greatest video game athlete ever). Gronkowski was the runner-up last year to cover athlete Odell Beckham. Cam Newton was considered the favorite to be the Madden cover athlete, according to The Sporting News, which listed him as a 2-to-1 favorite. Seriously, somebody took the time to come up with odds for this. What a time to be alive! Newton would have been a pretty good choice when you consider he was the best NFL player on the planet last season. Well, maybe outside of one Sunday in February. That isn't a cheap shot, it's a fact. But he was pretty special last year. Plus Cam was a runner-up to Richard Sherman two years ago. I was at that reveal at L.A. Live and Cam seemed to have a pretty good time working the crowd and seemed like a pretty decent representative. And if he wasn't going to be on the cover, when will he be? But you can't be too angry with the selection of Gronk. He's coming off a pretty good season in his own right. He had 72 receptions for 1,176 yards and 11 touchdowns, even though he missed some time. He's also the first tight end to ever grace the cover. And everybody just seems to love Gronk. Not that Newton's actions after the Super Bowl swayed the suits at EA Sports or anything. But everybody loves Gronk an awful lot. Nobody seems to enjoy life more. And if you think about it, Gronk is now a former Super Bowl champion, multi-time Pro Bowler, a former comeback player of the year, noted author and he had his own Gronk cruise! Being on the Madden cover might not even crack the top five of greatest things to ever happen to Rob Gronkowski. Though, I have a feeling that it probably will. Rob Gronkowski is the latest player to be featured on the Madden game cover. Take a look back at other stars to receive the honor. Because this is a pretty great honor. But with this great honor brings great responsibility. And by that I mean that many Patriots fans and fantasy enthusiasts are going to wring their hands and worry about the Madden cover curse. Let me put this into perspective for you. Beckham was the cover athlete last year. He had 96 receptions for 1,450 yards and 13 touchdowns. So I think we're done with the whole Madden cover jinx for the moment. If that isn't enough, Calvin Johnson had 122 receptions for 1,964 receiving yards the year he was on the Madden cover. So let's just go ahead and say the Madden cover jinx is no longer a thing. It's over. Done. Caput. Though, it probably won't stop people from making such proclamations. As these words are sitting on your screen, I imagine the Madden cover curse is trending on Twitter. 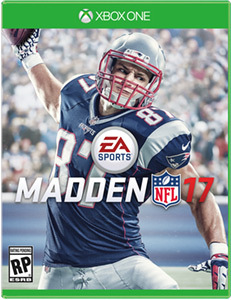 Seriously, if you don't take Gronk in your fantasy draft because he's on the Madden cover, well, you're not well. I also hope you're in my league. Because I will happily take him in the second round. Gronk will be presented on the cover in the most Gronk-est pose ever. Well, second-most Gronk-est pose outside of him twerking shirtless at a Las Vegas pool party. That would have been my first choice. EA Sports went a different direction with the Gronk Spike, and it's hard to find fault with that. But seriously, if anybody wants to cut me a Gronk party version of the cover, I'm totally game for that -- it should be some sort of special edition, right? Madden NFL 17 will be available for Xbox One, Xbox 360, PlayStation 4 and PlayStation 3 on August 23.